We hold regular training sessions throughout the year covering all disciplines and all levels in individual or groups sessions. Foxhunter Championship Winner Simon Nicholson teaches at Lower Farm Livery in Duns Tew (OX25 6JX) most Friday afternoons throughout the year. Lessons are in an outdoor arena with rubber surface and can be over a grid or course as an individual or group. Charges are £35/hour for an individual lesson and £20/hour for a shared lesson. A 30 minute lesson is £25. Once your lesson is booked you will be liable for the charge if you cancel less than 24 hour in advance. 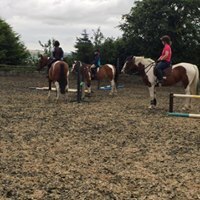 With an emphasis on team training, fortnightly clinics and regular training days take place at Regal Equestrian near Ascott (CV36 5PP) or at various local facilities such as Cherwell Equestrian Centre, Swalcliffe Grange, Crown Farm & Lyneham Heath. Sessions are normally in small groups of between 3-5 of similar abilities, although individual sessions can be booked, aiming at adding a social element to training sessions in a relaxed and friendly atmosphere. Suitable for all levels of rider from beginners to advanced, those wanting to learn a new skill or brush up on existing ones, perfect for those aiming to compete in BRC team events. As a former stable jockey to Dan Greenwood, Matt has a wealth of experience of training both horse and rider at all levels. He is a gentle and encouraging trainer, with natural enthausism for teaching. Sessions take place at Spring Farm near Little Tew (OX7 4JL) in an outdoor 20x55mm arena with Andrews Bowen Surface, usually on a Monday or Saturday afternoon. A 45 minute sessions costs £30.